Discussion in 'Football Forum' started by MyOnlySolskjaer, Jul 13, 2018. I'll be amazed if he goes on the US tour looks like he's gone. Think he's a class player that can very well for Utd in a squad and even first team role depending on the manager. I really rate Blind but it’s clear he doesn’t feature in Jose’s plans so it’s for the best. 16+5 is really a sorcerous price for a player who physically is worth a quarter of that and cerebral probably worth just over half of that. Jose confirmed a wizard if he ends up leaving for that price. There's a nice welcome home video on the Ajax-youtube that I cant post because of forum-rules. Really liked Daley Blind. He's a player that we'll probably look back on with fond memories during a bad time at the club. Mourinho gave him some high praise in his send off. He's in the prime of his career, so he doesnt want to be waiting around hoping for the odd game here and there. Didn’t we ban you before? Proven international and a good squad player with noticeable technique and passing ability who can play 3 position to a decent level. Consumate pro in the best possible age to be signed. The only reason he isn't going for somewhere between 20 - 30m is lacking a bit of pace perhaps. People who say we got a miraculous deal are probably those used to seeing us letting our players for peanuts only to lambast the board afterwards. Moment we actually got a fair price is seen us wizardry.. from the manager, of all people. I'm not sure what you mean. He ended up going for that price, which is a fantastic achievement from Jose for a player he couldn't even punt out the brown door at the start of the year. I don't believe I've been banned from any threads before? No idea, let alone the Blind thread. But this one will close won't it? More than happy to close the book on having to talk about Blind, frankly. A poor player and a torturous and bizarre experience of having to watch his calamitous efforts at playing CB are now over, we're a better team for it. No hard feelings for the lad, gave it his all and any United player that does that is worthy of respect in my book. He was decent, no more no less. Seemed to be a jack of all trades player, master of none. We bought him to play in midfield and he was hopeless, looked good at centre back but when Mourinho was appointed the writing was on the wall for him really. Dear oh dear - calamitous efforts at playing CB - to this day him & smalling have been the best defensive partnership post Rio & Vidic. Only striker that particularly got the best out of him were City players like aguero. I always thought we'd bought a braille newspaper. Ajax is playing atm, hopefully Blind will get some playing time. Blind got injured during a friendly with VFL Wolfsburg today. After ajax keeper Lamprou bumped into Blind trying to stump an incoming ball away, Blind went of the pitch with a seemingly hurtful back. The club nor the player has made any statement about the injury yet, so hopefully it's just precaution or at least nothing major. Spoke very highly of Mourinho in a recent interview. "I've really had a great time with lots of beautiful moments. I am very thankful for the fans there that was great. I am very thankful to Mourinho. It was nice working with him. He is a true winner and he is the best in transferring that to the group." Even though he barely featured during Mourinho's reign, he remained professional until the end. I still maintain that Blind is a good squad player and shouldn't be the first to go. Was a player not given a chance on his best position that he found at United by Jose. Considering we have 352 on our DNA - I'd put Blind as one of the best players we could have played as a central ball playing CB taking the ball up to DM. I think this squad has much less gaps playing 352 than 433 or 4231. Actually not a single gap in 352. Read the game far better than any of our current CB's, he must wonder why he was sold when he looks at the jokers we've kept. He's not had a great start at Ajax at all to be honest. Most of the Ajacieden I know are already moaning that they overpaid and that he adds nothing in the league. I think Blind is a player that can adapt to the squad he's in. If he's in a strong squad (United, Holland in 2014) he can fit in nicely, but if the level of his team drops, he drops with them. Really? That's not what i've heard at all, except that he was expensive. I think he definitely adds a lot to Ajax. I was at the game here in Kyiv yesterday and I thought he and De Ligt were very impressive together. That said; Dynamo is not the team it was even a couple of years ago. De Ligt looks the real deal btw. I think being the Dutch captain, bringing him back to Amsterdam and making sure he plays regularly is part of the motivation as well. He'll get better though, looks like he returned from an injury. Really? Wasn't he the stand out player and a level above for a year or two before he left Ajax? I don't know because I don't watch football, I am genuinely asking. He was fantastic for Ajax before United. Voted player of the year. Talking about the start he's had domestically this season. Ajax Drew at hom against Heracles and barely beat VVV in the first two games. Better players have left but I find it so frustrating with Blind because he was clearly a technically solid player, could play in multiple positions, seemed to have a good attitude and the fee we sold him for is not going to change the clubs ability to do anything or sign anyone. 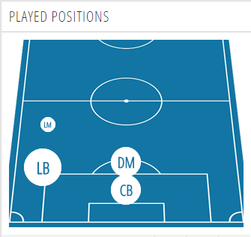 See the thing with Blind was - for me; he was the ideal 3rd centre back who plays in the centre. Whilst there is players like David Luiz that goes bombing forward not knowing when to keep still - someone like Blind would have had the ability to stay with the other defenders but dictate play forward as a midfielder would & significantly better than just a traditional ball playing CB can. Blind was the midfielder that could play in defence & against spurs; Jose played Herrera. I had been saying to play Blind like that for ages - they would give players like Bailly, Rojo, Smalling, Lindelöf & many more the stability whilst in reverse; they would provide the balance that Blind would need due to his lack of pace. Anyway - whilst I know Frenkie De Jong is a midfielder; he has also had games at CB. Whilst it may be absurd - do you think if a team allowed him to develop; that he could play as a midfielder who occasionally plays in between defenders? I just think that the 3 at the back system is in need of a false CB - the same way that 433 had a false 9. Blind was the midfielder that could play in defence & against spurs; Jose played Herrera. I had been saying to play Blind like that for ages - they would give players like Bailly, Rojo, Smalling, Lindelöf & many more the stability whilst in reverse; they would provide the balance that Blind would need due to his lack of pace.. I agree with a lot of this as I loved Blind. His only problem and it's a big Jose problem is that he is too easy to go past, doesn't stop the opposition enough, plus also struggled with aggressive players. Technically he was incredible, I'm surprised Barcelona didn't buy him. Yeah, he hasn't been ridiculously poor or anything but definitely nothing spectacular either. Part of the problem I think is that he played mostly in midfield in his last season at Ajax when he was voted player of the year. Now they have four or five midfielders already while other than De Ligt they have no proper centre halves, so it looks like he will spend the rest of the season in defense. And he might've been a bit rusty of course. Makes for a pretty decent pairing with De Ligt, who looks and plays like a 25 year old despite having just turned 19 years of age. I think Virgil van Dijk is captaining the national team and De Ligt is the Ajax captain.